This level has medium difficulty. For this level try to player from bottom and more from one side to break blockers and have more candies available to play. 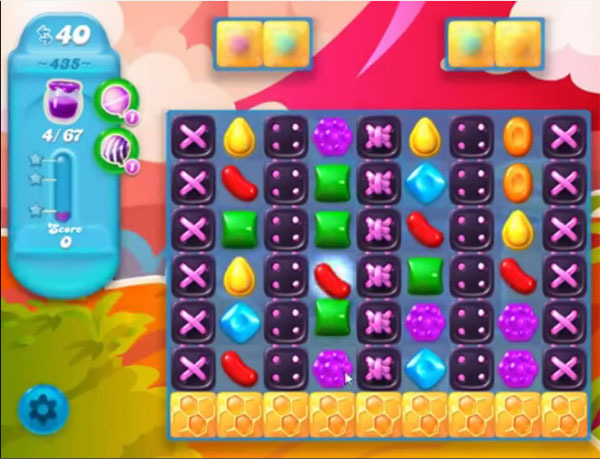 Then try to make special candy and combine with each other to break more blockers and spread the jam candies. Play near to jam candy to spread them to all over the board. Stuck on 435 too hard to combine special candies color bombs don’t ever come down hard to get the four jelly’s at the top to come down and not enough moves can’t clear this one with only 40 moves NEED HELP.VERY DIFFICULT LEVEL. Stuck stuck stuck on level 435 going to try it couple more days and if I don’t complete it I’m going to uninstall takes too many moves to get the jelly to come down can’t get special candies and NO color bombs never been on one this hard not enough moves VERY IRRITATED NEED HELP PLEASE I really love this game and want to continue playing it send HELP PLEASE. Stuck at 435 – love the game that has increase my patience and strategy levels how ever this level is virtually impossible that I have been trying to conquer for a week so now I have learnt to give in gracefully and deleted the game – candy crush is the loser ! This level needs more moves. very easy! am a novice but did it first time! early enough and had plenty of moves and even a color bomb with a stripe to take care of it with seven moves left! Whoops–that tip was at the very beginning, not in the comments. Thank you again! Ok, I really hate this level. Not enough moves to get the jam spread. It’s too hard to break the boxes at the top of screen. I like playing this game, but getting really tired of these super hard levels.